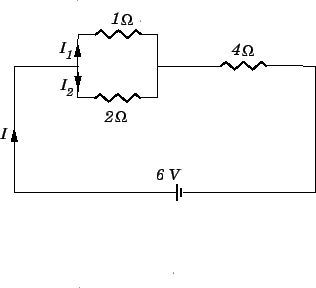 Question: A and a resistor are connected in parallel, and this pair of resistors is connected in series with a resistor. What is the equivalent resistance of the whole combination? What is the current flowing through the resistor if the whole combination is connected across the terminals of a battery (of negligible internal resistance)? Likewise, what are the currents flowing through the and resistors? giving . When a resistor is combined in series with a resistor, the equivalent resistance is . This is the current flowing through the resistor, since one end of this resistor is connected directly to the battery, with no intermediate junction points. Note that the total current flowing through the and combination is , which is the same as the current flowing through the resistor. This makes sense because the and combination is connected in series with the resistor.